Ah, Wednesday. Hump day. 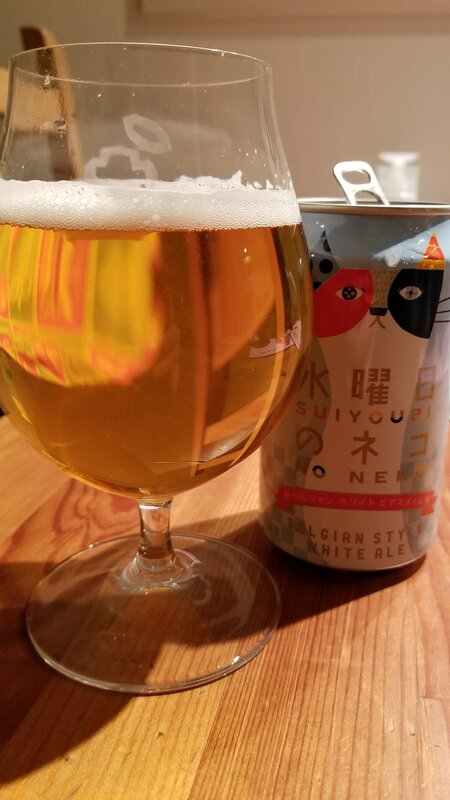 Middle of the week beers taste better than those on Monday and the knowledge that the weekend is coming means those one or two that you have will get you through to Friday, possibly that’s the idea behind Suiyoubi no Neko, a 5% Belgian style wheat beer. A lovely can entices you with a cat, which seems to be all the rage on the internet. Perhaps that’s the crowd that they are going for? Upon pouring, the colour was distinctly lighter and the body was clearer than most other wit beers. The aroma was so delicate that I felt if I smelt it anymore, it would break into pieces and be impossible to put back together again. The light carbonation as well was visible but with so few bubbles perhaps the brewery were on a pay per bubble limit? Typical smell of wheat, and a slight grainy smell were picked up and then gently put back down again. Taste wise, it was equally as delicate as the smell. Certainly not overpowering and was nicely balanced. Lemony and wheaty, with a little sweetness added to it. Went down well but a bit too subtle for my tastes. More of a lager/wheat beer hybrid. Suiyoubi no Neko is a good introduction to the world of witbeers for those daunted by the wheat and body of them.